According to the Census Bureau’s Housing Vacancy Survey (HVS), the nation’s homeownership rate in the second quarter of 2015 fell to a post-1967 low point of 63.4%. The homeownership rate decreased by 130 basis points on a nonseasonally adjusted basis from the second quarter of 2014 to the second quarter of 2015. 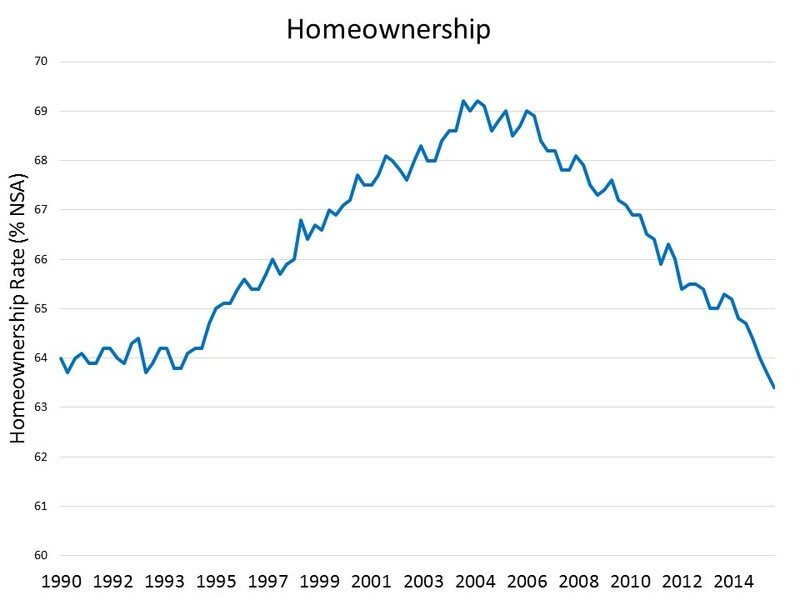 Compared to the peak at the end of 2004, the homeownership rate has steadily decreased by 5.8 percentage points and remains far below the 25-year average rate of 66.3%. 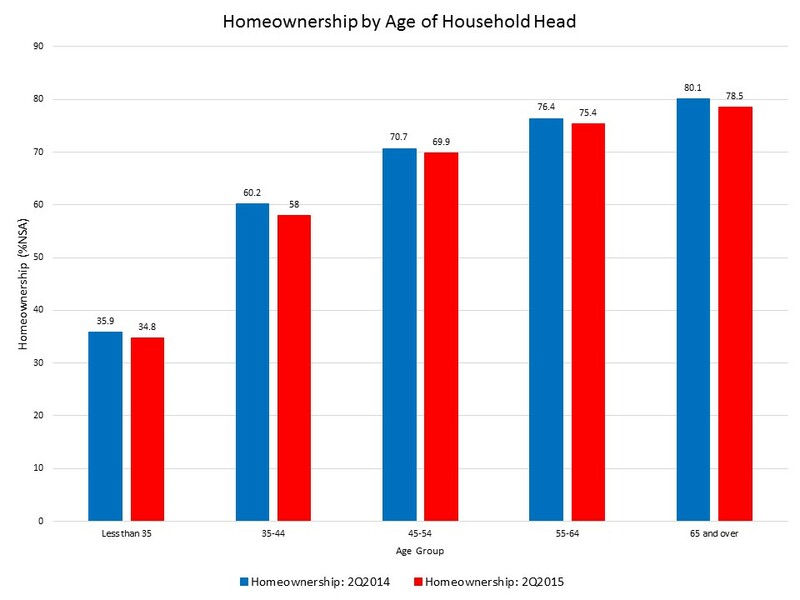 Homeownership rates decreased for all age groups on a year-over-year basis. The homeownership rate for household heads younger than 35 years old (34.8%) decreased by 110 basis points from the second quarter of last year. The largest decline, however, was for those aged 35-44 (58%), with an annual drop of 220 basis points. The nonseasonally adjusted homeowner vacancy rate continues to drop after the Great Recession. The current homeowner vacancy rate is 1.8%, 10 basis points lower than last quarter and the second quarter of 2014. The national rental vacancy rate remains relatively low and declined by 30 basis points to a 6.8% rate for the second quarter on a nonseasonally adjusted basis. 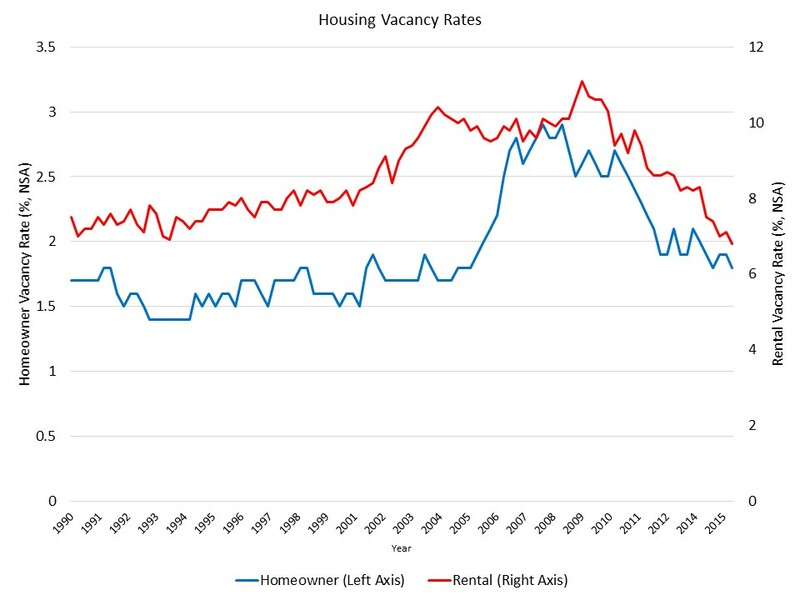 The rental vacancy rate was 7.5% for the second quarter of 2014. The housing stock-based HVS revealed that the number of households stood at 117.29 million for the first quarter of 2015. This is 1.62 million higher than a year ago and sustains gains recorded at the end of 2014. Growth in household formations will spur rental housing demand first, and ultimately, home sales.